Thanks for joining our commentary this evening. Until next time, goodbye. France are next in action against Argentina in Lille next week, while South Africa face off against Scotland at Murrayfield. WHAT A FINISH! France seemingly had the game wrapped up when they had a scrum deep in South Africa's territory. All they had to do was sit on the ball and the victory was theirs. 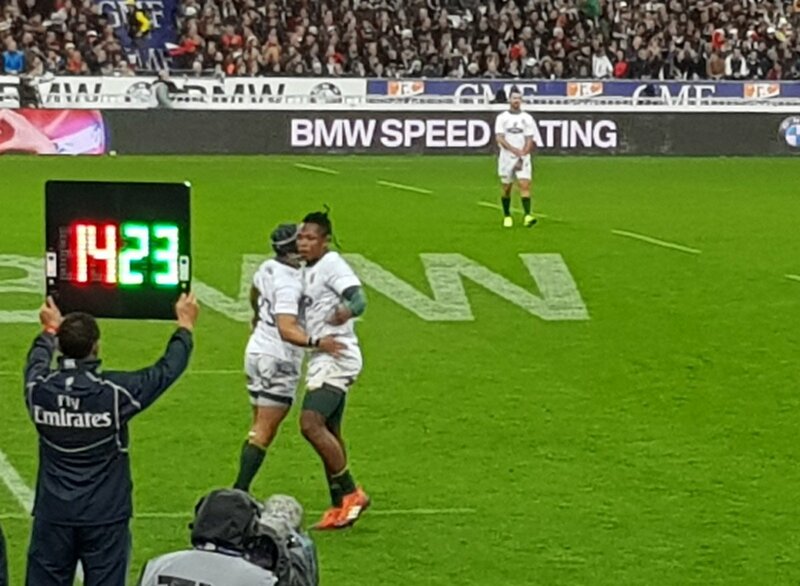 However, one penalty led to many others that allowed the Springboks to drive the length of the field before Bongi Mbonambi touched down in the corner in the fifth minute beyond regulation. It was a thrilling comeback from South Africa, who were down 14 points early in the second half. However, the boot of Handre Pollard kept them in the game and allowed them to record the win at the Stade de France. Les Bleus will see this as a sickening blow given the control they had on the contest, but their lack of discipline cost them in the end. Pollard ends the game with a kick through the posts. SOUTH AFRICA WIN THE GAME!! This time they're able to power over the line. The forward pack drives the blue shirts backwards. Mbonambi at the back peels off at the side and crashes over to touch down for the decisive score. Delight for the Springboks, but heartbreak for France. NO TRY! Dyantyi gets over the line in the corner, but the final offload to the winger was forward and the try is disallowed by TMO. However, there's another twist to the tale as France committed a penalty from the original lineout. South Africa have another opportunity. White shirts throw themselves at the line, but the home side hold firm for now. Is there space on the left flank for an overload? France have to mount a tryline stand to keep South Africa at bay here. De Klerk kicks the ball into space and Penaud gathers. France believe it's game over, but the referee has his arm out for another penalty. Jantjies kicks deeper into the 22. A penalty against France keeps the game alive. Jantjies kicks deep into France territory. France take the pace out of the game with their scrum. They know they're one minute away from victory if they retain possession. Dupont kicks the ball expertly into touch down the left flank and it rolls out of play at one metre out. Kolbe takes a quick lineout as South Africa try to break out of their own 22, but a forward pass hands France a scrum. 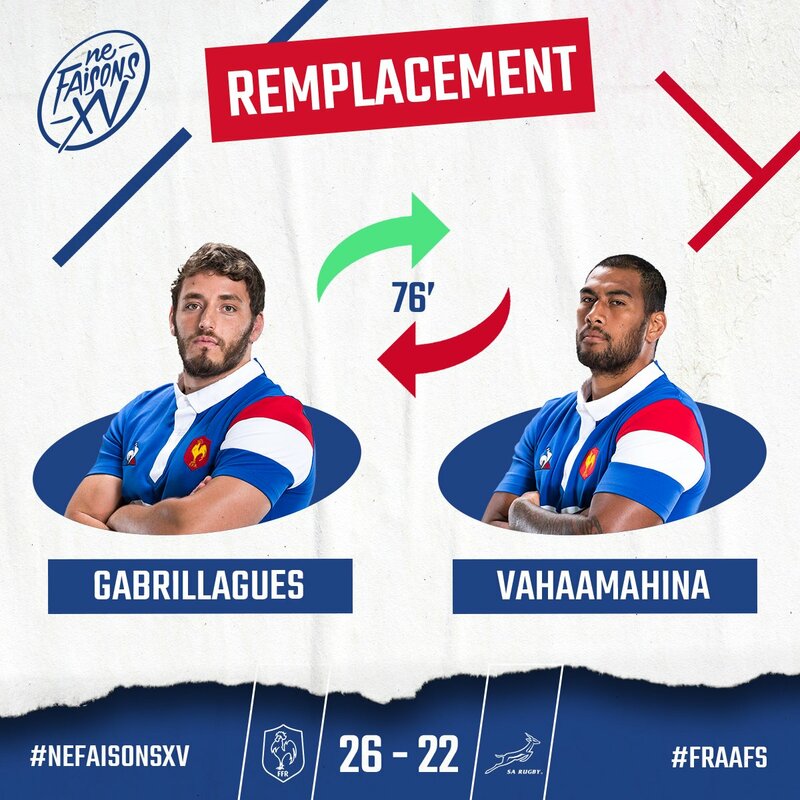 Mbonami is on for South Africa to replace Marx, while Gabrillagues is on for the hosts in place of Vahaamahina. Lopez is back on for Medard. Lauret wastes the opening he clings on to the ball at the breakdown. Owen penalises Les Bleus and South Africa remain alive in the contest. A mistake by Pollard leads to a scrum at half-way for France. Dupont sends the ball deep with a grubber kick for Iturria to chase down. Le Roux has to come across to boot into touch, although France have an attacking lineout 10 metres from the line. Pollard and Kriel kick the ball towards the France 22 on a break. Kriel makes the last connection and tries to beat out Dupont, but the scrum-half gets back to touch down over the line. France battle at the scrum and are able to clear their lines. One mistake could decide the contest at this stage. France bring the ball out of their own 22 with a scrum, but the threat from the Springboks remains. Kolbe makes a lightning break down the right flank and he weaves past two challenges before getting to the line. He stretches out to touch the ball down, but Iturria gets back to stop the winger touching down over the line, knocking it out of his grasp. TMO confirms that he failed to record the try. Belleau comes on to replace the injured Lopez, while Dupont is on for Serin. Serin belts his effort between the posts and France regain their four-point lead. Referee Owens wants a second look at the tackle on TMO. He awards a penalty to Les Bleus for the challenge as De Klerk escapes futher action. Serin will line up the resulting kick at the posts. De Klerk races into a tackle on Lopez as he kicks downfield. He catches the France fly-half in the air, sending him tumbling to the ground. It doesn't look good for Lopez as he receives treatment on the field. Chat replaces the France skipper and try-scorer Guirado. MISS! Fickou lines up a kick from almost 50 metres and gets his effort all wrong, firing well wide of the posts. France win a penalty at the restart and have a chance to restore a four-point lead over the Springboks. Fickou lines up this effort from distance. De Klerk tries to send Kolbe away down the wing, but his kick is too long for his team-mate and Thomas touches unopposed to give France an opportunity to clear their lines. South Africa have the impetus and are putting down the hammer with their approach in open play. They're driving Les Bleus back with every surge forward. Babillot replaces Picamoles, while Poirot was removed for Priso for the home side. Thomas du Toit comes on for the visitors for Kitshoff. Pollard dispatches his effort between the posts and South Africa close within a point of Les Bleus. Iturria catches Koch late on the neck as he tries to rise from being tackled and it hands Pollard another shot at the posts. Koch replaces Malherbe for the Springboks, while Slimani is on for the home side in place of Gomes Sa. The game devolves into a scrap between the sides at the breakdown. Referee Nigel Owens opts for a scrum inside the France 22, with the home side having the put-in. Kolbe replaces Nkosi for the visitors. Marx carries the ball with intent before De Klerk takes the decision to pen France back with a kick into touch inside the 10 metre line. Penaud handles himself extremely well under the high ball. He gets put under pressure by Nkosi, but he claims and brings the ball out of trouble. Doumayrou makes way for Fickou for the home side. Pollard sends his effort through the posts from 35 metres and South Africa are back within striking distance. South Africa win a penalty of their own as Picamoles is isolated and hangs on to the ball under pressure. Solid counter-rucking from the visitors. Pollard will go for the posts. Whiteley makes way for South Africa and is replaced by Snyman. Doumayrou presses the South Africa line under pressure and forces a mistake from Dyantyi and De Allende. It hands France another kick to extend their lead as Serin lines up a strike. Pollard brings his side within seven and it's as you were at the break as the fly-half dissects the posts with his kick. South Africa are back in the game immediately after the restart. Maestri fails to gather Pollard's kick and he fumbles the ball directly into the path of Nkosi. The Springboks winger gathers and races for the line five metres out to touch down. That could be a big moment in the game. Serin sends his effort through the posts and Les Bleus now hold a commanding lead. France extend their advantage in the early stages of the second half. Lopez's up and under caused havoc under the posts as Le Roux and Nkosi failed to gather under pressure. Bastareaud seized on the loose ball and powered over the line. We're back underway at the Stade de France. For all their talent going forward South Africa have done very little pressing. They absorbed the pressure from the home side well enough and used the boot of Pollard to score their points. However, they're going to have to be more adventurous in the second period to game back into the contest. France hold a lead at the break over South Africa as Guilem Guirado's try is the difference between the teams. Baptise Serin and Handre Pollard exchanged penalties in the early stages before another Pollard score was cancelled out by a Camille Lopez drop goal. Guirado's surge for the line before the interval put Les Bleus into a deserved lead. Thomas has a surge towards the 22, but then is turned over by a wall of white shirts. South Africa have a drive of their own through De Allende and Nkosi. Only Penaud stops their progress by booting the ball into touch to end the half. A scrum takes the half beyond regulation. France keep play alive and are driving towards the South Africa 22. Serin maintains his composure with a difficult kick from the right. He angles his effort from through the posts to hand his team a seven-point lead. France get the first try of the game. Guirado leads the way for his side as they overpower the Springboks at the breakdown. Les Bleus skipper spots space on the blindside and charges towards the line. He crashes though a couple of tackles before touching down. A huge moment in the game. Thomas' break reaps dividends after all. France turn the ball over deep in their own half from the restart. Thomas weaves his way out from the back with a super solo run. He breaks all the way into the South Africa 22, but he fails to beat the challenge of Le Roux, who stops the attack. 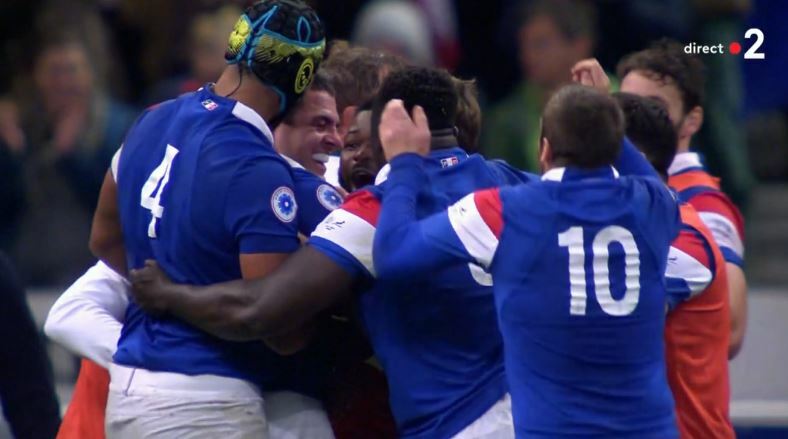 The France winger had Penaud and Doumayrou in support, but he failed to offload in time. France settle for three points rather than the try. Their progress with their forwards had been slowed by the South Africa defensive line. They created room for Lopez to fire at the posts and he made no mistake in splitting the uprights. Les Bleus have joy at the break down and Dyantyi races out of the line to try to make a tackle on Doumayrou. He offloads into space for Medard, who then releases Thomas. France continue their surge before Serin forces a mistake from Le Roux to win a lineout deep in South Africa territory. France have lost their impetus from the early stages. The Springboks are not making life easy for them at the break down. They're having to work very hard for their metres in the South Africa half. The visitors are sitting back and absorbing the pressure, while using the boot of Pollard to get on the board. Pollard kicks South Africa into the lead with another fine effort from distance. He's three from three so far this evening. This game may be decided by the accuracy of the boot. Iturria runs into two South Africa defenders and is in danger of turning the ball over. He clings to the ball and concedes a penalty. Pollard will go for the posts. 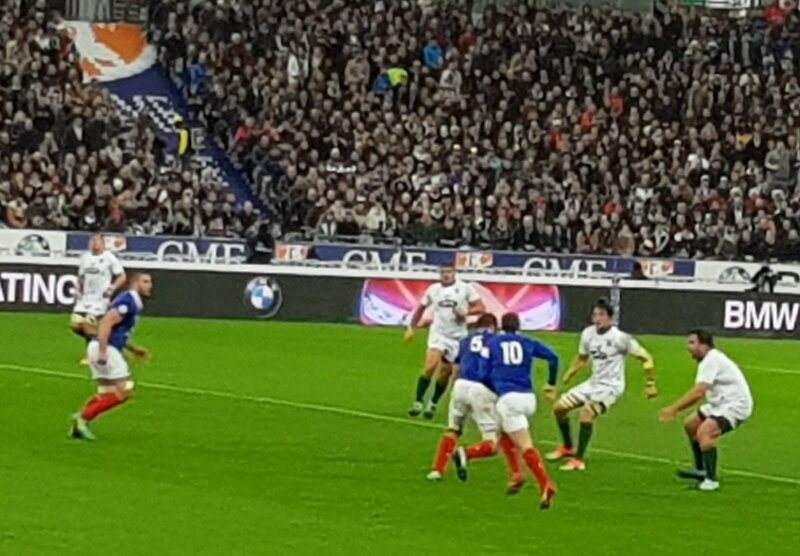 Medard fails to gather an up and under and it puts Les Bleus under pressure from De Klerk's kick. Serin looks to Bastareaud twice in succession to batter the South Africa line, but the visitors hold firm to stop his drive. France are trying to build through their forwards. There's not a lot of room out there for the creative players to express themselves. Medard has impressed in the early stages of the game and he produces a good tackle to stymie the progress of Vermulen. Pollard has no problem with the distance as he sends his kick through the posts from 40 metres. South Africa win the first battle at the scrum after a knock-on from Doumayrou. France are penalised and Pollard will go for the posts. The battle at the breakdown has been interesting thus far. Both teams are committing bodies into the ruck, with the home side holding a slight advantage at the moment. France fail to capitalise on their position. The forwards make a good drive for the line, but they get held up two metres short. Serin sends the ball out wide to the backs. Lopez sees a grubber kick blocked and Thomas has to revive the situation. He sends a kick through the line for Penaud to chase, although he just cannot touch the ball down in bounds. 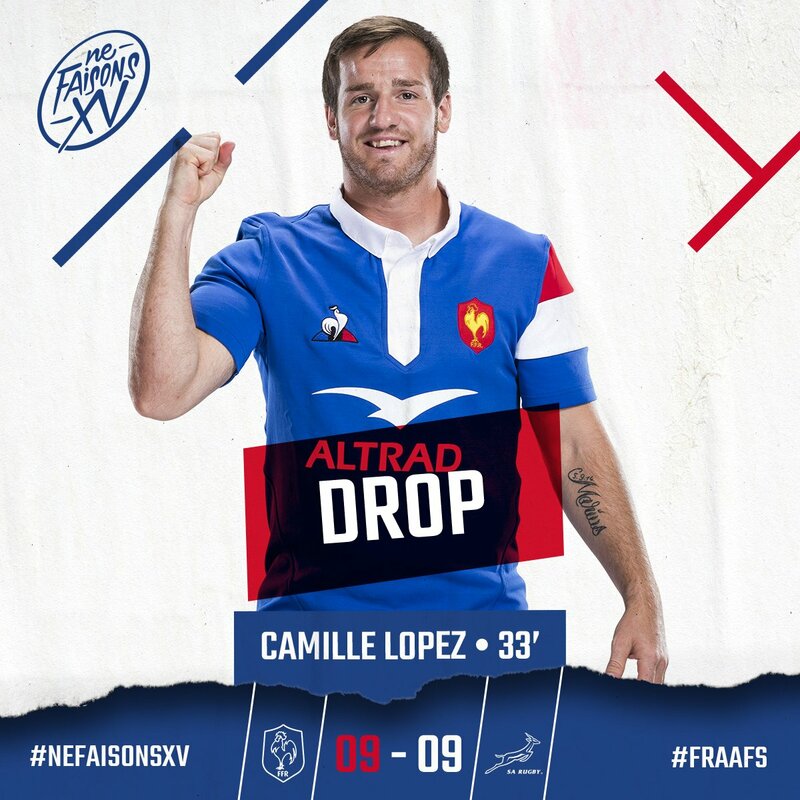 The kick from Lopez sets up Les Bleus inside the South Africa 22. They have a good platform to attack the tryline here. Kolisi comes in at the side of the ruck and it presents a chance for Lopez to kick the ball deep. Alarm bells ring in the South Africa line for a second as Pollard mishandles an offload, but he gathers before taking a tackle on the edge of his own 22. Pollard kicks his effort through the posts from close range, taking him past 300 international points for the Springboks. South Africa apply pressure immediately from the restart and get a penalty back as Maestri fails to roll away from the ruck. France's good start continues as Serin extends their lead. He has a slightly trickier kick on this occasion, but he curls his effort between the posts from the left flank. Serin angles a kick over the top of the South Africa line. Nkosi catches Penaud and the ball in the air, resulting in a slight knock for the France winger. The home side still have the penalty for an infringement at the breakdown by the Springboks for coming in at the side of the ruck. France move the ball with speed down the left flank as Bastareaud offloads into space for Penaud. The winger drives at the Springboks to take the ball over half-way. Penaud has been active for his side in the rearguard and he makes a good defensive claim under pressure before kicking into touch. Serin nails his kick between the posts from 30 metres out and the home side have the lead. South Africa are penalised at the breakdown for offside and Serin will have an opportunity to kick for the posts. Medard makes a break over the gainline for the hosts before feeding the run of Thomas. Lopez spots Penaud in acres of space on the left flank, but he just misses the winger by a fraction with his cross-field kick. France win the first major battle at the breakdown as Iturria and Picamoles get the better of their counterparts. De Klerk's grubber kick puts Les Bleus under pressure on the edge of their own tryline. Penaud offloads sheepishly towards Thomas behind him, who is forced to hurry a kick into touch. We're underway at the Stade de France. The players are out on the pitch, so we should be underway shortly. Handre Pollard needs one point to reach 300 career points in Test rugby. Should he score 14 points or more in this Test, he will surpass Naas Botha’s career record of 312 points and will move up to fourth position on the all-time point scoring list for South Africa. South Africa's changes are more straighforward from their defeat to England. De Klerk and Le Roux come into the side in the backfield for the Springboks, while Eben Etzebeth has been ruled out due to injury and is replaced by Mostert. Medard comes into the side for Les Bleus ahead of Benjamin Fall due to Jacques Brunel’s preference for a stronger kicker at full-back. Bastareaud and Doumayrou start at centre as Wesley Fofana misses out due to injury, while Damian Penaud gets the start on the wing. Poirot, Guirado and Gomes Sa earn the nod on the front row, Vahaamahina partners Maestri in the second row. Picamoles, Lauret and Iturria complete the forward line in a much-changed starting XV from the side that faced New Zealand in Dunedin. SOUTH AFRICA XV: Willie le Roux; Sbu Nkosi, Jesse Kriel, Damian de Allende, Aphiwe Dyantyi; Handre Pollard, Faf de Klerk; Steven Kitshoff, Malcolm Marx, Frans Malherbe; Pieter-Steph du Toit, Franco Mostert; Siya Kolisi, Duane Vermeulen; Warren Whiteley. REPLACEMENTS: Camille Chat, Dany Priso, Rabah Slimani, Paul Gabrillagues, Mathieu Babillot, Antoine Dupont, Anthony Belleau, Gael Fickou. France return to action for the first time since their hammering at the hand of New Zealand in the summer. Les Bleus were trounced 49-14 in Dunedin and will be desperate to start their campaign with a stronger outing against the Springboks. South Africa were narrowly defeated by England last week and felt that they should have had a late kick at the posts when Owen Farrell shoulder charged Andre Esterhuizen. However, the decision went the way of the Red Rose, but Rassie Erasmus will be hopeful that his team can get their first win in the Northern Hemisphere of the tour on the site of their triumph in the 2007 World Cup. Good evening and welcome to the live commentary of the November International clash between France and South Africa at the Stade de France. RT @lecoqsportif: 🏉 Toute la famille du coq était là ce soir dont nos employés de Romilly qui ont conçu les tenues. 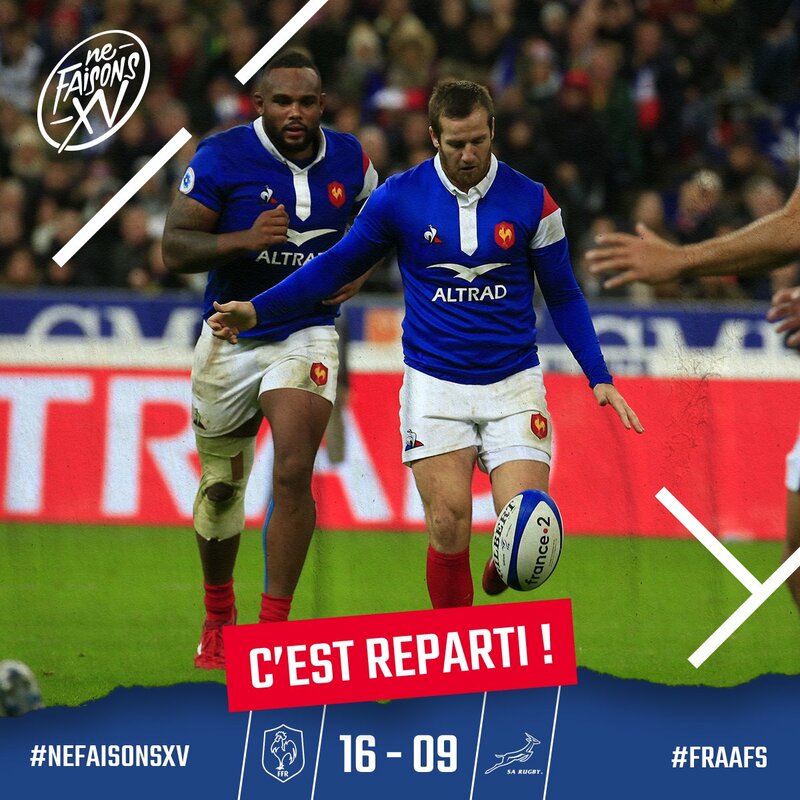 RT @lecoqsportif: 🏉 Le #XvdeFrance s’incline devant l’Afrique du Sud. Ça s’est joué de peu ! 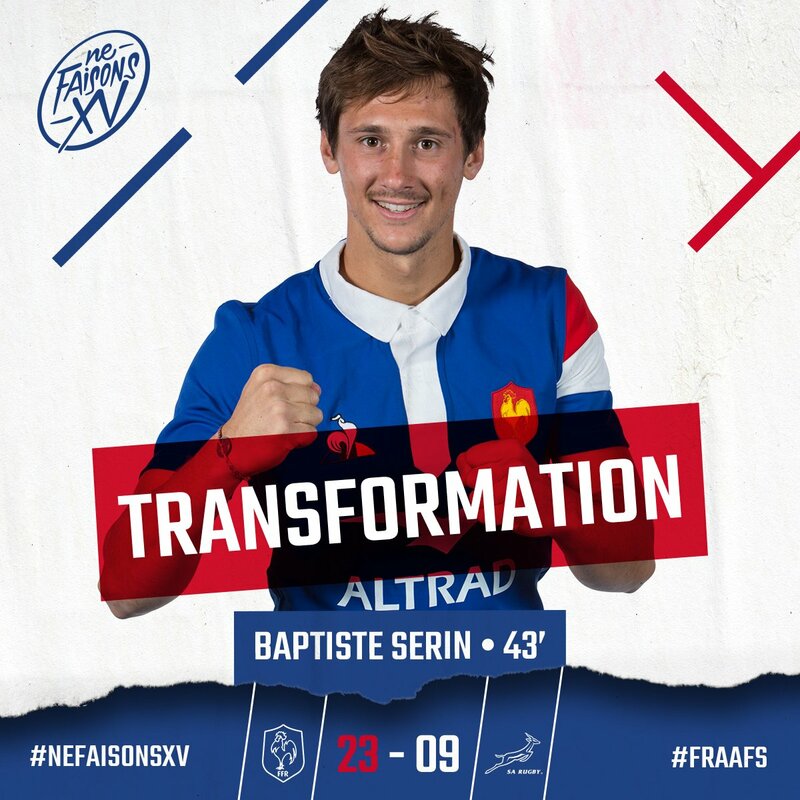 67min - Serin on target with his penalty kick, stretching the @FFRugby lead to 26-22. 🔃 Auteur du premier essai de la soirée, @guilhem_guirado cède sa place à @chatbranger. Double-changement pour le XV de France. 60mins - Pollard nails another penalty to narrow the score to #FRAvRSA 23-22. RT @francetvsport: Le capitaine Guilhem Guirado libère les Bleus ! 52mins - Pollard on target with another penalty. RG Snyman goes on for Warren Whiteley. 43min - Bastareaud and Nkosi score in quick succession, @FFRugby now leading the #Springboks 23-16. 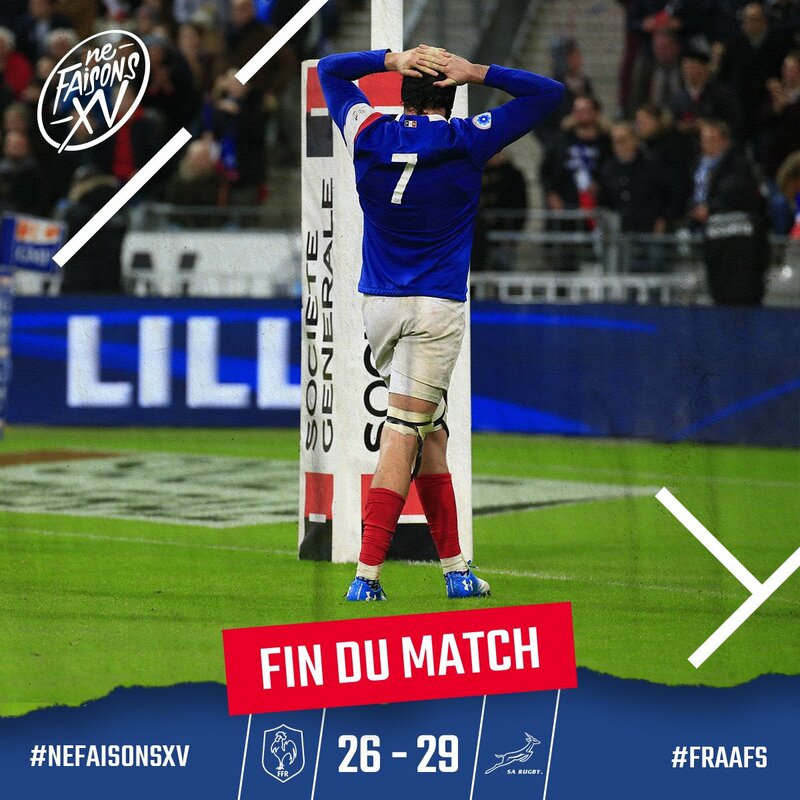 RT @lecoqsportif: 🏉 Belle première période du #XVdeFrance ! HT - @FFRugby lead the Springboks 16-9 at the break thanks to skipper Guirado's converted try. 🇫🇷🇿🇦 37' L'ESSAI DU CAPITAINE !! 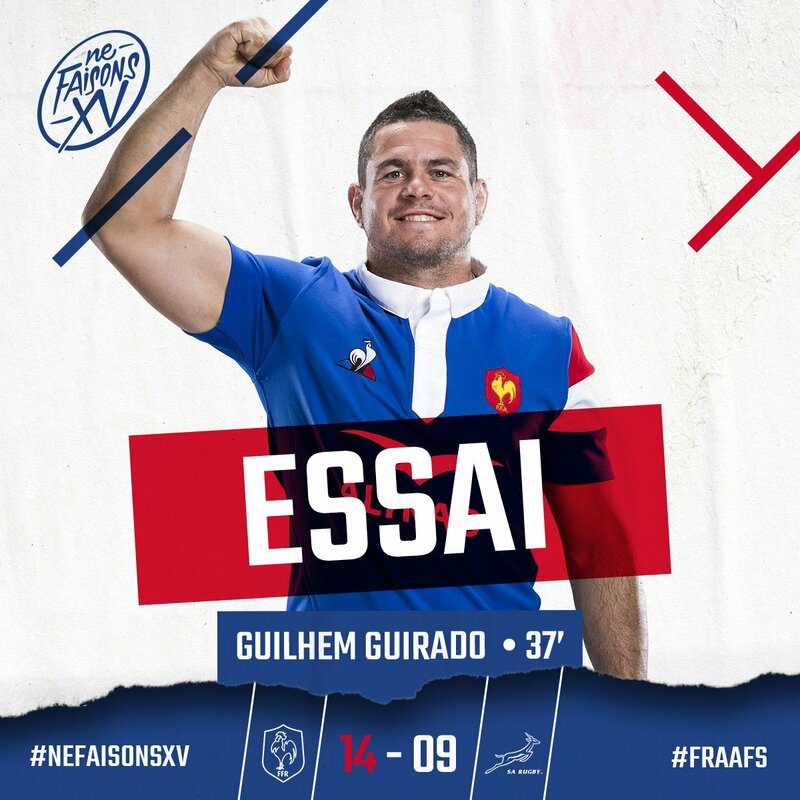 @guilhem_guirado pour le premier essai de la soirée ! Le drop de @Lopezcamille64 pour remettre les deux équipes à égalité ! 🇫🇷🇿🇦 27' Emmenés par un @MaxMedard en grande forme, les Bleus font un début de match prometteur !